In the opening moment, we see a master craftsman at work on a model of Sleepy Hollow. However, Henry Parish has not come to build great things, but to tear down what is already there. As we wait to see his schemes play out, tensions are building elsewhere. Jenny Mills is released from police custody after a confrontation with Sheriff Reyes, as Reyes alludes to future issues if Jenny doesn’t make changes in her life. The distrust between these women grows when Jenny uses Abbie’s police credentials to look up information on Reyes and uncovers a dark link between the Sheriff and their mother. After a brief argument between Abbie and Jenny, the group is split apart once more. Ichabod and Abbie visit Tarrytown Psychiatric with the intention of visiting Irving only to discover they have been barred from visiting him. This is followed by the greater revelation that Henry is incognito as Irving’s lawyer and puts them on his trail leading to the case of the week. Our duo spots Henry leaving a bank and chaos follows soon after. Hearing a gunshot, Abbie rushes to the bank and encounters the normally mild mannered bank employee, Lydia Galloway, with pistol in hand. Sinister forces being at work is evident. Before she can deduce the actual machinations of the event, Sheriff Reyes bursts onto the scene, killing Lydia with a single shot to the chest. While Ichabod and Abbie collaborate on the events that just transpired, we see a dark coin rolling across the floor and leaving in the hands of another man. 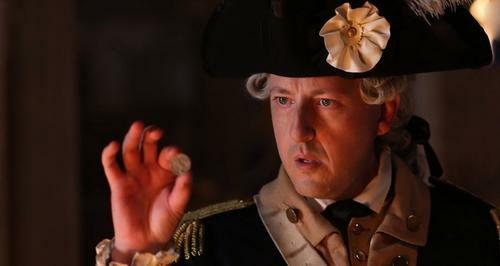 Utilizing a combination of security footage and information from Ichabod’s actions during a mission against counterfeiters for General Washington, the evil behind Henry’s actions begin to unspool. This, coupled with a contact of Jenny’s who is a known expert on odd artifacts, puts Ichabod and Abbie on the trail while the man from the bank is shown building a bomb. Time is running out and our heroes don’t even know it. Tensions are building in the lair of evil as well. The camaraderie previously seen between the Headless Horseman and Henry Parish seems to be dissolving over difference in opinion as to what specific actions to take next. While they bicker amongst themselves, Katrina gains knowledge of Henry’s new base of operations and feels it to be a link from which she can possibly reform a bond with her now estranged son. At the docks, the duo meets Jenny’s contact, Nick Hawley. With his rugged looks and tight fitting button-up shirt Hawley makes a first impression that invokes memories of certain other rouge adventures that is only further enforced by his mysterious nature and smug charm. Hawley does, however, provide information on the coin’s origin. It is reveled to be Roman and linked to two of the most famous traitors in human history: Benedict Arnold and Judas Iscariot. With evidence from the past it is known that the coin motivates those who possess it to commit acts of evil. Abbie and Ichabod set off to locate and secure it before more blood can be spilt. However, they are not successful in finding the man from the bank before he kills his father with his homemade bomb and is taken into police custody. Now at the police station, Abbie has a confrontation with Sheriff Reyes over the new information concerning the link between Abbie’s mother and Reyes. Meanwhile, Ichabod attempts to retrieve the coin only to have a confrontation of his own against Henry. While the men discuss the powers of the coin and the true nature of humanity, the women talk on secrets long past and doing what must be to protect the innocent. After these pairs go their separate ways Ichabod is expelled from the station by Reyes and given a twenty-four hour window to provide her with identification, while Abbie’s efforts to secure the coin prove futile. The object is already back in the clutches of Henry Parish and he has his next target already in sight: Jenny Mills. Abbie and Ichabod discover this development when they reunite with Hawley and he reveals knowledge of Jenny’s intention to cause harm. At first, they believe Abbie to be the target but quickly realize jenny is after the sheriff. Combining Hawley’s and Ichabod’s knowledge, they form a plan to wrestle away the coin and save Jenny. Doing so means obtaining consecrated glass which leads to a gut-busting confessional scene that highlights recent plot developments while skewing them in an almost soap-opera like fashion. With object in hand and a plan in mind, this new trio ventures into the woods to cut off Jenny while Abbie and Ichabod have a wrenching conversation on allies that reveals Abbie’s distrust over the intentions of Katrina Crane. Nothing is more important, to Abbie, than stopping Moloch’s plans. But knowing Katrina to be a mother, she can’t see her picking that which must be done over the chance, however slim, of redeeming her son. Sheriff Reyes now lies in the crosshairs of Jenny and it is only through a snap deception on part of Abbie, coupled with a last second bit of teamwork between Ichabod and Hawley, which puts the coin out of circulation and brings everyone together once more. With Reyes safe and Henry’s plans forestalled, if not stopped, Ichabod pulls a bit of his own trickery and manages to speak with Irving in Tarrytown and let him in on Henry’s plot. Frank is now torn between his friends and his family while stuck in a dark place. What decision he will eventually make is left up in the air as is the potential decisions of all their allies. As Abbie stated earlier and has been repeated over the series, the only ones Ichabod and her can truly trust are one another. When Abbie returns to the station she is somewhat shocked by Sheriff Reyes turning over her mother’s file and telling her she only did what was best for them. Transcripts from the file reveal Abbie’s mother was tormented by demons and wanted to be placed in the psych ward to protect her daughters. Meanwhile, Hawley pulls through much to Ichabod’s surprise and provided him with false identification in order to gain the Sheriff’s trust. 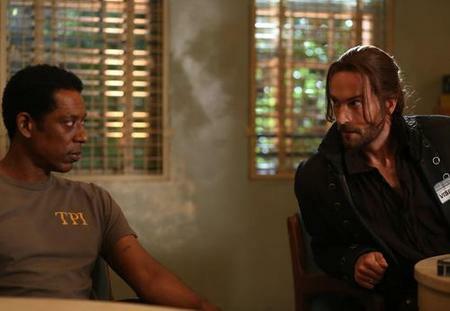 This theme of trust running through the episode is enforced as Ichabod calls it the only currency with any true value. The beginning strands of many alliances are formed in ‘Root of All Evil’ and if the opening moves of Henry’s stratagem are any indication, our heroes are going to need all the help they can get.